RIO DE JANEIRO – As a globally-important metropolis that possesses the sights of Paris, the sounds of New York City, the charm of London, and the sun of Los Angeles, Rio de Janeiro offers endless possibilities to the film industry, leading the Festival do Rio 2010 (Rio International Film Festival) to rightly set its sights high within the industry at large. 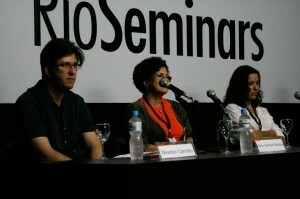 Screenwriters Newton Cannito, Maria Carmem Barbosa, and Rosane Lima at a seminar on television production in Brazil, photo courtesy of RioMarket. Benefiting from the country’s new-found economic stability, and from the roles it is set to play in the FIFA 2014 World Cup, and as the host of the 2016 Olympic Games, Rio is currently one of the most dynamic and ambitious cities anywhere in the world, attracting both business capital and talent alike. The film and television industries are of course no exceptions, and the Rio Film Commission is currently working to conjure a fresh worldwide image for the city as more than simply being a pretty backdrop, but also a wise business decision as a location for film production. The Festival do Rio, on the other hand, has been juggling missions on two fronts, by promoting the city as a major cultural capital with their selection of over 300 films and various cinema-related events (making it Latin America’s largest film festival), and working to actively promote film production and distribution in the country. 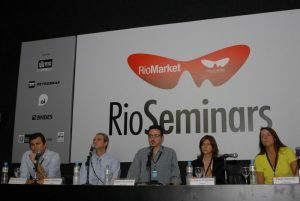 As such, RioMarket, the business division of the Festival attended by industry professionals from around the world, is running a full schedule with daily seminars with classes on screenwriting and directing, as well as discussions on the issues facing the industry, the effects of political and legal adjustments, and new technologies. The registration-only RioMarket events include seminars on financing options, audiovisual laws, copyright and insurance issues, transmedia, and opportunities in foreign markets, mainly Argentina and the fellow BRIC countries Russia, India and China. There is a special focus on television, comfortably the primary medium of communication in Brazil, as well as the current issues facing the European film industry. Providing, too, an ideal environment to network, a full day is devoted to exploring the bilateral business opportunities between the United States and Brazil. Development executives at a panel on film financing in Brazil, moderated by Sérgio Sá Leitão, the presidente of RioFilme, photo by André Macieira. Besides the film production focus of RioMarket, Festival do Rio has one more crucial mission in its hands: exposing promising films and filmmakers by exhibiting and promoting their work, in an effort to hep them achieve the recognition they deserve. As any filmmaker is perfectly aware, having successfully produced a film and finalized post-production is only half the journey, because in an industry as competitive as cinema, “getting discovered” means hard-earned recognition that comes only after months or years of perseverance, being a relentless fixture at the film festival circuit, and the knowledge that even a discovery may not guarantee distribution or future financing. Festival do Rio has been tackling the issue of introducing promising new talent on several fronts. In an open display of its pride and support for the national cinema, the Festival’s only prize Troféu Redentor is awarded to fiction, documentary, and short Brazilian films that are chosen to be included in the competitive Premiére Brasil section, which favors the films of new directors. The Festival’s emphasis on shedding light on films by unknown filmmakers, first-time directors, and those unlikely to find publicity or distribution due to their provocative subject matters or lack of commercial viability, shows its commitment to make Rio not only a global center of film production, but also a cultural hub where the new generations filmmakers are raised, discovered, and presented to the world.